We’ve all heard horror stories of contractors who caused serious damage, then left the property owner holding the bag. That is why is it essential for real estate investors to have an independent contractor agreement in place before a contractor begins conducting renovations on their fix and flip or rental properties. While the idea of a contract may seem daunting, it’s really just an agreement to ensure both parties understand the expectations of the work. Whether the project is something simple and quick or a bit more complex and time-consuming, it is in the best interest of both the investor and the contractor to create an independent contractor agreement prior to starting any work. 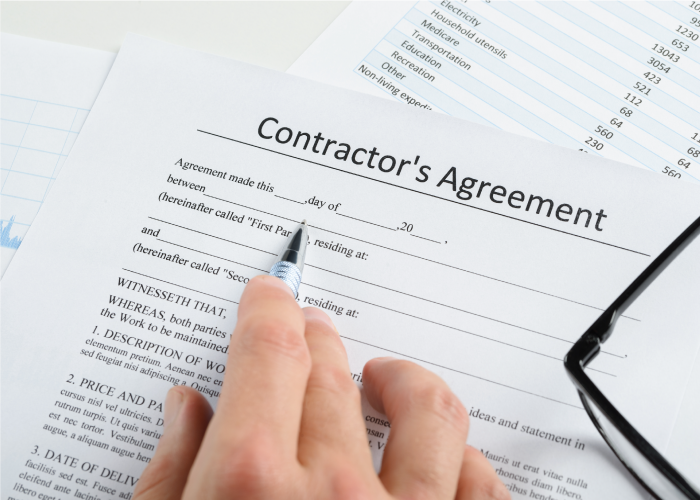 When dealing with contractors, we use contracts to avoid misunderstandings. Verbal discussions are useful, but a signed document removes all room for miscommunication. A contractor contract is just a way of knowing what we’re paying for, how much we’ll pay, and how long it will take. When problems arise, the existence of a signed contract most often settles any disputes quickly, without the need for lawyers. Beyond disputes, an independent contractor agreement ia a great way to ensure high quality work from the outset. What Should a Contractor Contract Contain? Job Scope. The contract should outline the scope of the job, including the specifics of the work the contractor will perform. This ensures a clear understanding of duties and expected results. Price and manner of payment. Explicitly state the price in the contract, as well as the method and timing of payments. Include an itemized list of materials to provide additional security. Completion Time. The contractor should know the project’s timetable. For more complex jobs, the contract can contain an estimate of different phases of completion. General Provisions. This section of the contractor contract defines general quality expectations. These can include completing the job in a workmanlike manner, complying with building codes, licensing of workers, contractor insurance, permits, and other concerns. Parties Involved. Include names and addresses of both the owner and the contractor. Signatures, Dates. These bind the contractor and owner to the agreement by law. A simple homemade contract for contractors, or one adapted from the internet is a great place to start. That said, lack of legal knowledge can render our good intentions invalid if things come down to a dispute. A good real estate lawyer will evaluate a contract for around $100-$200. You can find dozens of sample independent contractor agreements online for free. Some come from real estate law firms while others are hosted on university websites. Here’s a list of sample contractor contracts you can adapt to your needs. Berkley Law School contractor contract. This fairly comprehensive contract comes from one of the nation’s most respected law schools and delivers as a free .pdf download. HomeAdvisor large and small job remodeling contract for contractors. These are two great size-specific forms geared toward the professional investor. LawDepot customizable contractor contract. This one starts out with boilerplate. Users can customize it by answering a few minutes of questions. The MaRS independent contractor agreement. This contract comes as a free .pdf download from MaRS, an entrepreneur/business resource service.